I have spent about more than a year in python, but I come from biology background. I should say I have got some understanding of for-loop and nested-for-loop to workout the solution to the problem I have had. But, I suppose that there are better and comprehensive way of solving problem. 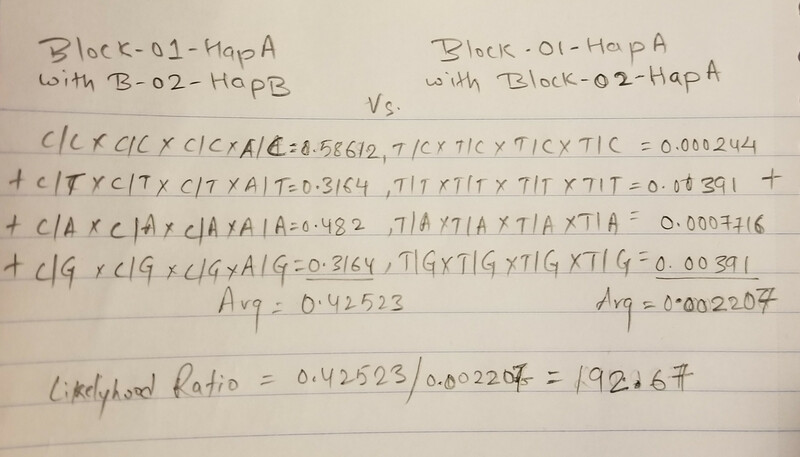 Below is the code I wrote to solve the haplotype phase state between two haplotype blocks. 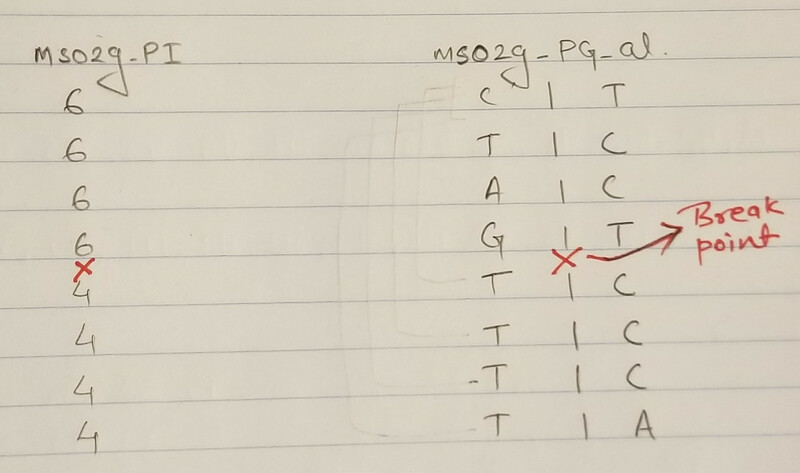 In the given data I want to solve the phase state of haplotype for the sample ms02g. The suffix PI represents the phased block (i.e all data within that block is phased). For sample ms02g C-T-A-G is phased (PI level 6), so is T-C-C-T. Similarly data within PI level 4 is also phased. But, since the haplotype is broken in two levels, we don't know which phase from level-6 goes with which phase of level-4. Since, all other samples are completely phased I can run a markov-chain transition probabilities to solve the phase state. To the human eye/mind you can clearly see and say that left part of ms02g (level 6, i.e C-T-A-G is more likely to go with right block of level 4 C-C-C-A). The top haplotype-PI is block01 and bottom is block-02. The left phased haplotype within each block is Hap-A and the right is Hap-B. I count the number of transition for each nucleotide of PI-6 to each nucleotide of PI-4 for each haplotype configuration. and multiply the transition probabilities for first nucleotide in PI-6 to all nucleotides of PI-4. Then similarly multiply the transition probability for 2nd nucleotide of PI-6 to all nucleotides in PI-4. then I sum the transition probabilities from one level to another. I have the following working code with python3: I think the transition probs can be mostly optimized using numpy, or using a markov-chain package. But, I was not able to work them out in the way I desired. Also, it took me sometime to get to what I wanted to do. Any suggestions with explanation. Thanks.
''' iterate over the first Haplotype Block, i.e the k1 block.
''' Now, we have to start to solve the possible haplotype configuration.
''' To store the sum-values of the product of the transition probabilities.
''' for storing the product-values of the transition probabilities.
''' 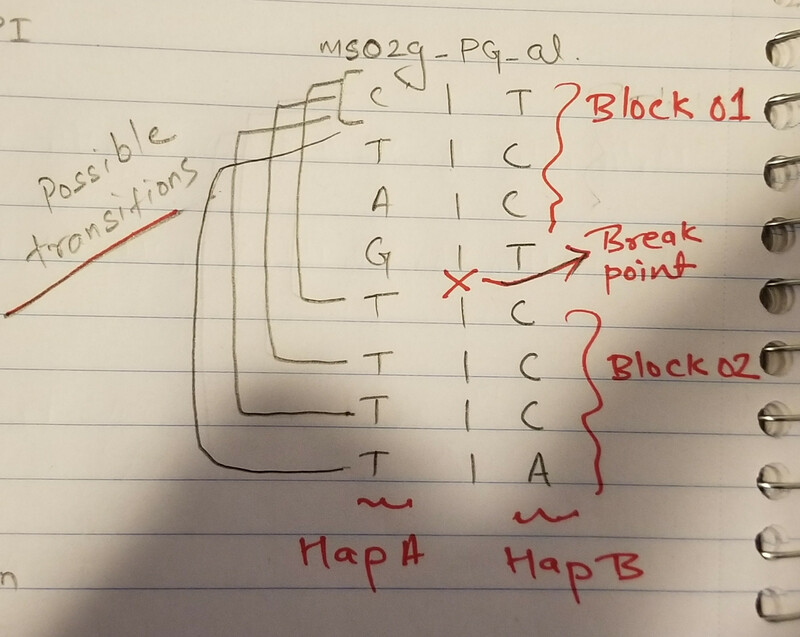 Now, we read each level of "m" to compute the transition from each level of "n"
''' create possible haplotype configurations between "n" and "m". 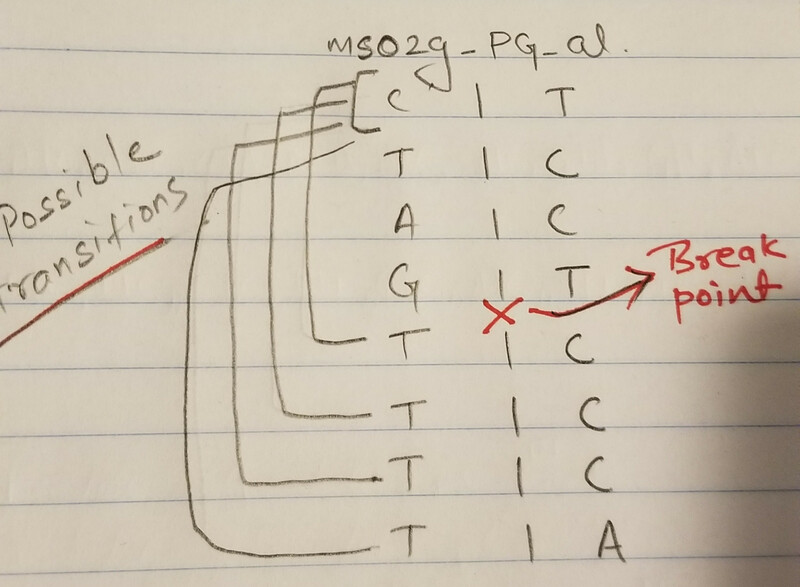 required data (nucleotide and transition probabilities). Calculate joint probability for each haplotype configuration. You only use collections for OrderedDict, so import that directly. Consistency is important. Don't write hapB1A_hapB2A in one place, hapB1A_B2A in another and hapB1AB2A in another. Don't use variables as comments where comments would work better. There is a lot of structure here, like p[ATGC]_[ATGC] that suggests working at a higher level would save a lot of effort. But enough of this for now. To be frank, this makes no sense. You very sensibly added from __future__ import division, so the float case is useless. You catch ZeroDivisionError and return 0, which is not explained or warned about. Your docstring is misplaced and does not match PEP 257 guidelines. Your docstring says you "count the number of transitions", but you do no counting, rather a single division. Let's fix the easy issues and move it to neighbor the only place it's used so we can revisit it at a more appropriate time. """Return the number of transitions.""" Almost all Python code should be encapsulated inside functions, and doing complex logic in the global scope is highly disadvised. You don't use f yet, so it is best to only open it later. Eventually we'd like it to only wrap the part that actually cares about it. Using strings as multiline comments is not idiomatic and rather disadvised. The file should be closed as soon as you are finished with it, and the comment should be reformatted. # Create a dictionary to store required data. # Also, data should be stored with unique keys. I am not going to mention using strings as comments again, but you do need to fix this everywhere. Remember that this does not apply to docstrings, where you should follow PEP 257. Let's quickly work on that docstring. First of all, note that it's in the wrong place and not in the right voice. """Read the data as blocks (based on PI values of ms02g) at a time.""" Secondly, the function is generic. It does not read data. It does not care about ms02g. IT just groups data in a certain manner. That is what it does, so that is what it should say it does. Its name should reflect this. lists of all values mapped to in order of occurence.""" I do not believe there is any reason for these dictionaries to actually be ordered, so I would abandon that. I would also prefer short names to single letter variables. of all values mapped to in order of occurence.""" """Parse input into OrderedDict keyed by ms02g_PI. haplotype blocks that needs extending. Data should be stored with unique keys. I don't entirely understand your docstrings, so I may have mangled them a little. The final with and assignment itself will eventually be moved into another function. What;s with those semicolons? More importantly, these assigned values are never used since they always get assigned ahead of time, so they can only hide bugs. Remove them entirely! It is best to just move it there, though you should use a tuple instead because, being immutable, those can be built once and then reused. # Loop through each sample to compute initial probs and transition probs. # k1,v2 and for the later block as k2,v2. Because all the shared variables have been removed, it is now obvious that each iteration is stateless except for the file being written into. This means we can move the entire contents of the loop into a function, though it is cleaner to keep the first if outside. # This is just a front part of the header. # The rear part of the header is date dynamically depending upon the number of samples. Obviously this needs a better name than some_function(f, k1, v1, k2, v2), and better documentation than just an ellipsis. I will leave that as a task for you to figure out. # Iterate over the first Haplotype Block, i.e the k1 block. # and similarly on the right as Block01-haplotype-B. # Now, we have to start to solve the possible haplotype configuration. # Iterate over the Haplotype Block, i.e the k1 block. Even better, produce a table. which I would find nicer as two separate print statements. This is not good; don't use dead variables as comments. There are other places you do this; fix them all. Secondly, this once again implies you should be using some kind of higher-level container. # of "n" after reading the number of each nucleotides at that position. # for storing the product-values of the transition probabilities. # these are updated for each level of "n" paired with each level of "m". # now, we read each level of "m" to compute the transition from each level of "n"
# to each level of "m". # .. inner loop ..
# the number of each nucleotide at that position. # updated each inner iteration. By this point you no longer want transition_probs, so you can just replace the name. Since everything is a data structure here, you can just implement a basic iteration. # find possible configuration between "n" and "m". You have another redundant assignment, with a redundant comment, to remove. and similar for the second run, though you should hoist the zip and use an else instead of an inverted if. I'm going to leave this here for now, since I only have so much time to cover changes, though you can continue a lot of these cleanups in the same way. Other major untouched issues are around clearer high-level explanations, building the program out of separated functions, removing hardcoded paths, and moving to a matrix representation rather than a dictionary approach. Not the answer you're looking for? Browse other questions tagged python performance beginner numpy markov-chain or ask your own question.